Dehydrated tomatoes have a rich bold flavor that when combined with olive oil and basil seems positively decadent. The tomatoes and basil infuse the olive oil which is lovely on salads, for dipping bread or drizzled over grilled peppers and eggplant. 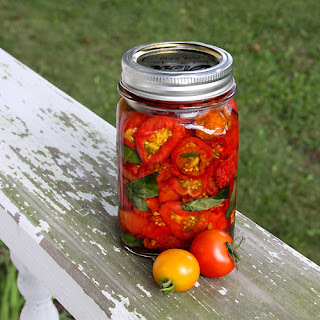 To learn how to dry tomatoes check out this post: How to Dehydrate and Oven Dry Tomatoes. Dried tomatoes in oil are less of a safety concern than [low acid vegetables like garlic] mixtures in oil because the pH of tomatoes is generally 4.6 or lower. In addition, by drying the tomatoes, conditions become even less favorable to growth of C. botulinum due to a decrease in water activity. However, to ensure safety, it is recommended that all tomato in oil and herb in oil products be stored at refrigerator temperatures. Sterilize a pint jar by washing with soapy water and then pouring boiling water over the inside and outside of the jar. Boil the screw band and lid in hot water. Once the jar is dry begin placing the dried tomatoes into the bottom. Use a clean skewer or spoon to pack the tomatoes together. Then add a couple sprigs of basil. Continue layering tomatoes and basil until the jar is full. Then pour olive oil slowly over the top. Insert the skewer or the handle of the spoon down along the sides of the jar five to six times to force any air pockets out. Make sure the oil completely cover the tomatoes. Seal with the sterilized lid and band and refrigerate up to one month. The bonus with packing in olive oil is you get both tomatoes and olive oil flavored with the dried tomatoes. The oil is great for salad dressing, dipping bread or making pasta. How do you cook with dried tomatoes or the oil they are packed in? Those tomatoes look KILLER! My tomato plants are full of tomatoes...gonna have to dry some and pack them in oil! Thanks for the tip. So, are there any issues with bacteria? I was going to infuse some olive oil with basil but my research on the Internet scared me off. Eliotseats - If there are air bubbles there is potential for bacteria growth. Which is why you sterilize the jars, pack in oil and then make sure to get the air bubbles out. I have in the past not refrigerated. However, my research shows that refrigeration is a good idea and not to store longer than a month. I got my information from Martha Stewart Living (2002) who I would think does the research on safety before publishing. If you are worried make oil packs 24 hours before you use them. That way everything is fresh. Store your dried tomatoes in the freezer until you are ready to make the flavored oil. Commercial sun dried tomatoes packed in olive oil are acidified to prevent bacteria growth. I have yet to find a recipe for the home cook that explains how to do this. This is such a great idea. What a great idea to use up the extra tomatoes from the garden. I need my friends' tomatoes to start going crazy so they pass some my way and I can do this. I love sun dried tomatoes in oil and would much rather make them than buy them. Thanks for the recipes and for that continued explanation in the comments! Yum! What lovely colors and I love the idea of dipping into this in the middle of winter! mmmm... there's nothing i like better as an appetizer than dipping bread in balsamic vinegar and olive oil. this is a welcome alternative! thanks for sharing! btw, i've just passed on to you the versatile blogger award... follow this link! Just excellent! Love how colourful and brilliant that looks! I love it! I hope we have enough tomatoes left to try this! Foy, those tomatoes look yummy. Nice work. A few of my tomatoes are starting to ripen and soon, I will be swimming in garden tomatoes! Yay! As to your reader, that wanted to infuse olive oil with basil, it can be done, much like you have with your tomatoes. These articles from Colorado State Extension office might be of use to Eliotseats in infusing olive oil with basil. These articles were interesting to me and I'd had this question posed to me by others before so I thought I'd pass it along. If you scroll down part way, the article is there. The above article is the one referenced in the blurb on flavored oils and vinegars. Love the advice on process. I'll be making some of this real soon. Beautiful and inspiring. Well done, Foy! Those are gorgeous. They would make a lovely present. I'm going to have to stock-up on some tomatoes and give it a try. Thanks. OMG that looks amazing. How pretty. I love drying tomatoes in the oven, in olive oil. I've done it every summer for a few years now. It makes for terrific pasta sauce too. Thanks for passing this on. I forgot about canning my own dried tomatoes. I love your photography of the tomatoes. I dry tomatoes in the oven and found a nice recipe for mini tomato tarte tatins. They are great in a pasta sauce or as a crostini topping too. Thanks a lot for the tips..
Botulism is your main fear and it "can be prevented by killing the spores by pressure cooking or autoclaving at 121 °C (250 °F) for 3 minutes or providing conditions that prevent the spores from growing. The toxin itself is destroyed by normal cooking processes – that is, boiling for a few minutes." Says Wikipedia. Tossed with spaghetti is really good. I'd like to keep this for longer than a month, and am wondering if freezing would work. Apparently freezing olive oil will not harm it and it will return to normal consistency when thawed. (http://www.oliveoilsource.com/page/freezing-olive-oil) Just wondering about the impact on the dried tomatoes and basil. Thoughts, anyone? Tishmeister...I am wanting to do along the same lines as you. I am going to follow a suggestion further up. We will freeze our dehydrated tomatoes and I know that freezing fresh basil is the best way to save it. So, I will make fresh everytime I need to use it to make my bruschetta! Hope that helps! "Infused oil and oil-based mixtures of garlic, herbs or dried tomatoes can pose a health hazard if not kept refrigerated. In fact, a number of cases of botulism have been tied to these oils, commercial and home-prepared mixes, which were not refrigerated." Both of these quotes can be found on the same page. To find the one mentioned in the post scroll almost to the bottom and look for the bold text "Vegetables and herbs in oil". Can you give them a hot bath and store them? I am new to canning and wondering? Why are these called "sun dried tomatoes" when they are dried in either a dehydrator or an oven? I dried my tomatoes and stored them in airtight jars. I will add the olive oil a couple days before I serve them. We'll see how that works. My first attempt didn't turn out too well - there is bright green growth throughout the jar! Is it necessary to completely fill the jar with tomatos/basil and oil, or to just cover the tomatos/basil with the oil? I made a couple of jars of this last year. I also put some dried tomatoes in the freezer. These were fabulous and we enjoyed them all winter long. You can take the frozen ones and pack in oil during the winter for a fresh tomato taste. What to do with Elderberries?